Over the past year, there has been a lot of discussion about how the shuttle service is not meeting all of the needs of our residents Here is what is being done to meet those needs. • Campus shuttle hours and days have been expanded. Monday through Friday, 9:00 a.m.
– 7:00 p.m.; Saturday and Sunday, 11:00 a.m.
– 7:00 p.m.; Holidays, 9:00 a.m. – 7:00 p.m. (call for service). • If you need on-campus service before or after scheduled hours, you just need to call shuttle dispatch. Before hours are 5:30 – 9:00 a.m., after hours are 7:00 – 10:45 p.m.
• Wheelchair shuttle service to and from RGN while Wilton Overlook is being constructed. 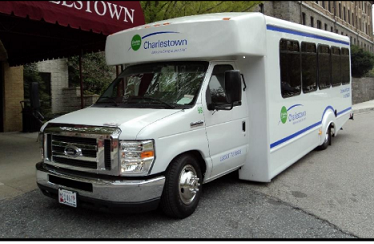 • Additional shuttles are used for services at Our Lady of Angels Chapel on Saturdays, Sundays, and special events. • Supplemental on-campus shuttle service for Treasure Sale days. • Spotlight Trip of the Month – a no-additional- cost day trip offered to different venues monthly. • Arbutus Library/Senior Center on the third Monday of every month, which includes two separate pickup times: 11:30 a.m. from the library and 12:30 p.m. from the senior center. • Catonsville Farmers Market (seasonal). First and third Wednesday of the month beginning in May. Driver waits for you. • Arbutus Post Oﬃce, every Wednesday at 9:30 a.m. Driver waits for you. • Giant Grocery Store and Wilkens Plaza stores. Mondays, Wednesdays, and Fridays. 8:45 – 11:30 a.m. Last pickup on campus at 11:00 a.m.
• Weis Grocery, adjoining shopping center, Rite Aid, Kevin’s Salon: Tuesdays and Thursdays, 8:45 – 11:30 a.m. Last pickup on campus 11:00 a.m.; Saturday, 11:00 a.m. – 1:30 p.m., last pick up on campus 1:00 p.m.
• St. Agnes Hospital, Pine Heights Professional Bldg., Seton Bldg., Seton Imaging, St. Agnes Medical Center, 3350 Professional Center, Rheb’s, and Teresa’s Salon: Monday – Friday, 8:00 a.m. – 5:00 p.m. Pickups every hour at CCI. Last pick up at CCI is 4:00 p.m.
• 716, 720, and 724 Maiden Choice Lane Professional Bldgs. • Lansdowne Elementary School once a week during school year (volunteers). • First Tuesday of the month, “Around Town” tour for new residents. • The shuttle averages 100 employees a day, which means they are not driving cars onto our campus, which would be added stress to our parking situation. In addition to the above services, we provide quality sedan service anywhere in the Baltimore/Washington Metropolitan Area at a rate of $2.75 per mile. We also ensure that dialysis patients are taken to appointments on holidays and during inclement weather. Our mission is to share our gifts to create a community that celebrates life. Your shuttle drivers and dispatcher strive every day to share their gifts with you and provide quality Transportation Services, which includes convenience, promptness, and courtesy of staff.